This is another Thomas Nast original 1864 print. 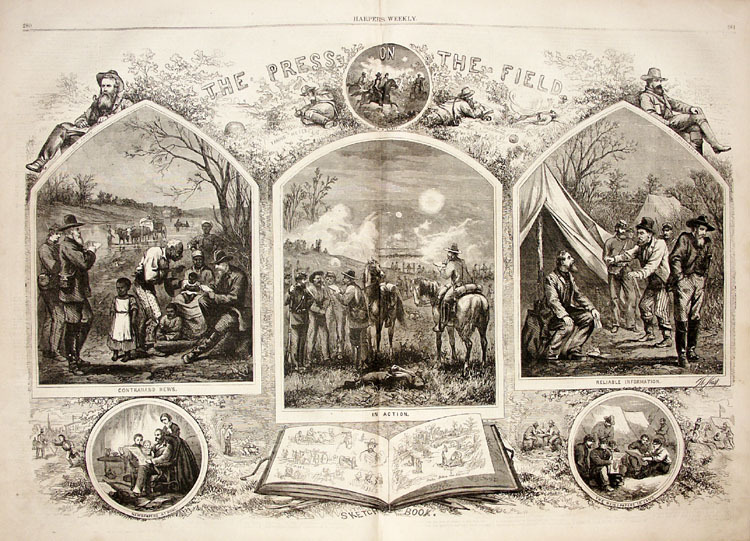 This leaf is titled, "The Press in the Field", and shows various scenes associated with a Harper's Weekly Civil War Illustrator. The illustration is an original leaf from an 1864 Harper's Weekly newspaper. The image shows a number of interesting scenes associated with the press during the time of the Civil War. The picture gives the inside scoop on the operation of both the Civil War Illustrator, and the Civil War Correspondent. The central image shows a correspondent interviewing soldiers, just out of a battle. The smoke and confusion of the still raging battle can be seen in the background. Also pictures is an artist on horseback, sketching the scenes of battle. The upper left is an image of a man with a beard, and a sketch pad. The image is captioned, "Our Artist", and this image is believed to be a self-portrait by Thomas Nast. The various drawings on the top of the leaf show the artist and correspondent in the field. They can be seen in the midst of battle, hunkered down and they capture in words and drawings every thing that is going on around them. The center left image is captioned "Contraband News", and shows the correspondent interviewing emancipated slaves. An old black man is seen telling his story, along side two women and three children. This is undoubtedly a story of slavery, escape, and then freedom. The black man appears very animated as he tells his story. As the correspondent records his words, an artist is seen standing to the side capturing the scene in his sketch pad. To the right, the central image is captioned "Reliable Information, and shows the correspondent interviewing another man. In this case, the sketch artist has his back turned and is not drawing the scene. The lower central inset image shows a drawing of Thomas Nast's Civil War sketch book. It can be seen that he carried a large sketch book, had a ribbon that could tie it closed. The final two inset images are on the bottom in the left and right corners. These show the fruits of the labor of the illustrator and the correspondent. In the left corner, an eager family is seen reading the news of the war. In the lower right corner, soldiers in a Civil War camp can be seen reading the pages of Harper's Weekly for news of the war. This is a fascinating image of the work of Thomas Nast and other artists during the Civil war. We hope you enjoy this complete Gallery of the Civil War works of Thomas Nast. We have created this digital archive for the use of researchers and students of Thomas Nast. Please remember that the digitally enhanced images are Copyright © Son of the South Material. For more information, contact paul@sonofthesouth.net . We created this Thomas Nast Gallery to digitally preserve Nast's Civil War work for posterity. We are now making the original, 140 year old leafs available for a price of $250 each. The proceeds from the sale of the material will enable us to continue to expand the material featured on our site. Please contact paul@sonofthesouth.net if you are interested in acquiring one of these original leafs.